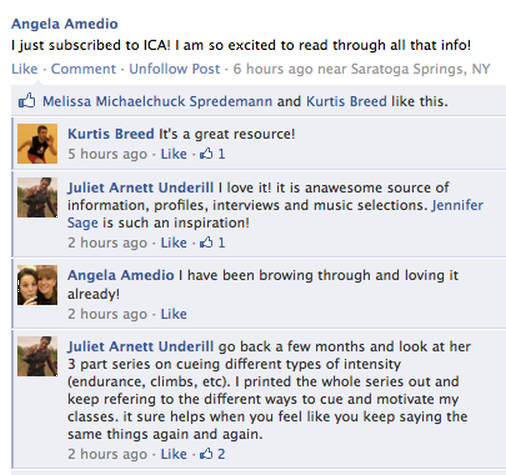 The following are testimonials from a variety of sources – emails, comments on blog posts and ICA articles, and Facebook comments on the ICA facebook page. Some refer to specific profiles that Jennifer or other contributors have created for members. Ciao Jennifer, Grazie for the passion and dedication you put into your work. I can never thank you enough for helping me in becoming a better Instructor. And your ability to reach people in the deepest part of the heart, well, that is for sure unique to YOU! Thank you again Jenn. Hi Jennifer, I’ve been a fan since the first time I heard you on ICI pro, and was heartbroken when you left, but completely understand that things aren’t always what they seem from the outside. I was so happy to find you were still posting on your blog and have been following that way. 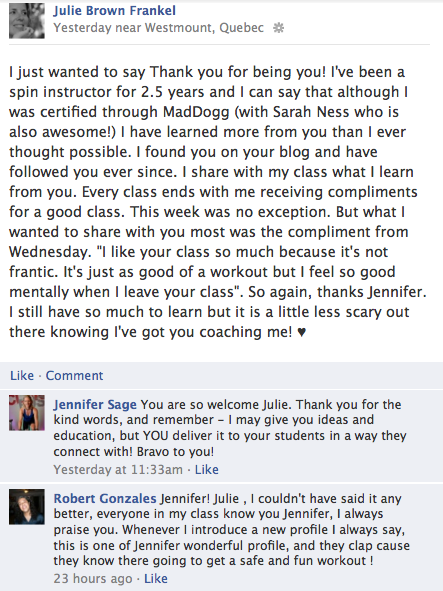 I’ve improved leaps and bounds as an instructor and owe much of that to you! Thanks! Shannon. Hi Jennifer, My name is Tina Centofante and i have been teaching for 10 months now. I’m actually good friends with Melissa Marotta, and she was the one who encouraged me to teach and I consider her a mentor. 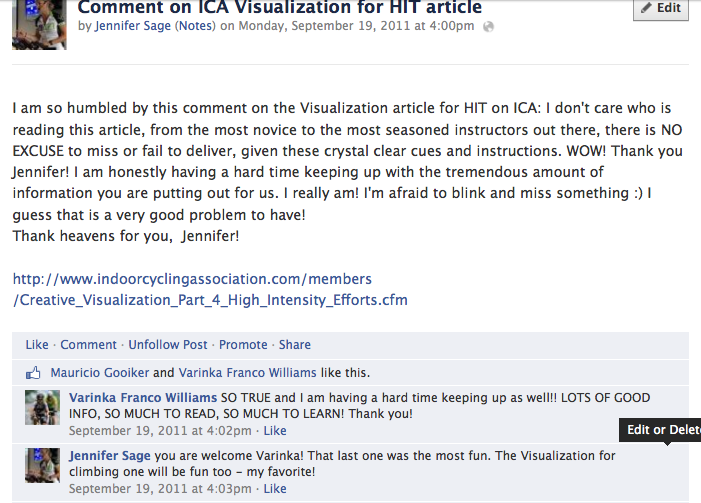 Since then I have absolutely fallen in LOVE with instructing indoor cycling, as well as with the concepts of exercise physiology, heart rate training, and educating. I am currently studying to become an ACE certified personal trainer, and it’s all thanks to my indoor cycling instructor experience! I am an avid road cyclist, triathlete, rower, and skier. I must say my journey to becoming certified and instructing has opened my eyes to my own training and I have improved light-years using my HRM! For most of my life i was overtraining and putting my body through hell for all my races!! training has become so much more ENJOYABLE. This is the concempt of what i would love to educate my students/clients with, and thus has made me passionate with motivating and inspiring people about fitness. 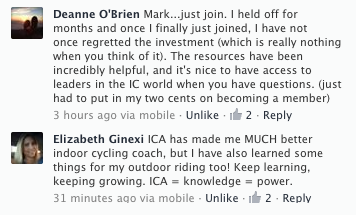 I am a member of ICA, and I must say I’m addicted! I have followed your funhogspin blog for some time now, read your ebook about 3 times, and i have so say that you are an incredible coach and educator. I look up to you as an idol and someone who i’d like to become (I’m 22 yrs old!). 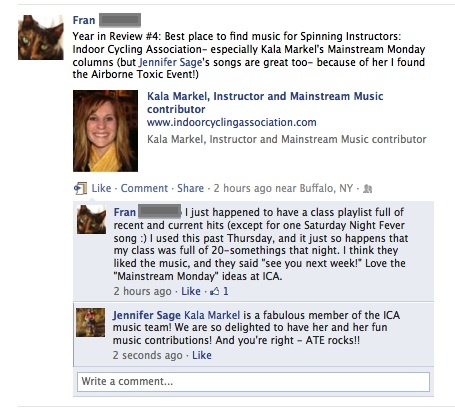 Also from Energia Magica: Jennifer, I just taught Energia Magica for the first time, exactly as you wrote the profile. Epic and AMAZING! All of my students were “giggly and floaty” after the ride. Total euphoria. Comments: “Wow.” “That was amazing/incredible.” “Let’s do it again!” “The class went by SO fast. I was concentrating on the moment and before I knew it class was over.” “The music was inspiring and helped me get up the hill.” “The music totally matched what we were doing, where we were riding.” Tomorrow I’m teaching it again (perhaps even off the bike as I have a wait list for my class and might let a wait-listed student have my bike). I’ll let you know how that class likes it. Thanks for sharing such a fantastic ride with us! Keep up the fantastic work. I’m hooked. sorry for that. I only looked at iTunes, Amazon and eMusic.